Have these questions ever popped into your head before? Well if you have had any of those thoughts, or similar ones, home automation is the answer for you. To give you some ideas, you can have notifications sent to your phone if your smoke/carbon monoxide detectors go off, a flood is detected, or someone enters when they’re not supposed to. You can also assign each guest with a new access code for a pin pad on your door, and the code will expire when they check out at the end of their stay. This makes you and your guests feel more secure. This article is written assuming you have very little knowledge about home automation. To start off, we’ll take a look at how to use a smart lock for your Airbnb smart home. At Automatic Homes, we recommend the August smart lock system. August has been around for a while and is currently selling their second generation of smart locks. August currently works with Amazon Alexa, Google Home, and Siri. While those are not as necessary for when you are away, they do come in handy if you also live in your home. August has three accessories which work well together and will be necessary for our remote access plan. These three products are the August Smart Lock Pro, August Connect, and August Smart Keypad. The Smart Lock Pro is the actual device you attach to your door and only takes about 10 minutes to install. The great part is that you don’t need a new key, and works with the one you already use. By itself, it can automatically lock and unlock your door as you leave/come home, however that does not help the situation for Airbnb visitors. August’s Connect is a wireless device that allows you to connect your Smart Lock Pro to your home wifi network. By being connected to the wifi, you can now control, unlock, lock, and set schedules for visitors from anywhere in the world where you have an internet connection. While this is an improvement, you still need to allow guest access. To allow guest access, you will need to purchase the August Smart Keypad and place it outside your door. Once you purchase and install all three August products, the next steps become very easy. To control access all you need to do is open up your August app and create a new access code. You can make a new code for each guest, and it will expire when they are supposed to check out so they can never enter your home again. You can also set up access codes if you have cleaners come between guests. They can always have their own access code and only use it on a schedule so guests do not have to worry about them being there when they shouldn’t be. Another advantage of the August system is that you can be notified whenever the door is opening. If the door is opening 50 times one night you may want to call the guests and see if there is a massive party going on. Please note: While an August smart lock is much safer than a traditional key, there are quite a few components that work together. While they will work 99% of the time, we still recommend a backup plan. The easiest plan would be to have a lockbox nearby outside your home where you can give your guest the access code if the August system does fail. When you live far away from your rental unit and may not have a guest for one or two weeks, you may start to worry about anything that could happen to your property. What if there’s flood damage and no one notices until your guest enters the unit a week after the flood started? Well, our favorite product for this is the D-LINK Wi-Fi Water Sensor. This water sensor is not directly usable with Homekit, Alexa, and Google Home. It is, however, compatible with IFTTT which is the important issue here. IFTTT is an online service that stands for “If This, Then That”, meaning if one thing happens, it can trigger something else to happen in your home (IF I come home, THEN turn on my lights). Compatibility with IFTTT means you can assign “if water is detected, then ___”, whether that means sending a notification to your phone, setting off an alarm, or turning on your lights. Really for Airbnb, you don’t need it to do anything fancy, but you do need something that will send a notification to your phone the second it needs to. The other smart sensor we recommend is one of the most-popular sensors on the market. This is the Google Nest Protect, which detects smoke and carbon monoxide. Even if you don’t purchase any of the other products in this post, it’s inexcusable for you to have an Airbnb and not have one of these installed. Sold as either battery-powered or hardwired (both the same price), the Nest Protect will notify you of any smoke or CO2 that it detects, and also notify you if it’s running out of batteries. This way you’ll know immediately about any potential damage that may happen and will be able to take the appropriate actions. This is also compatible with IFTTT, meaning you can turn on the fan/lights when it detects anything. The Nest Protect can also unlock the doors with the right setup. Contact us if you want to learn how. For thermostats, we like to recommend the Google Nest E (see our review here). 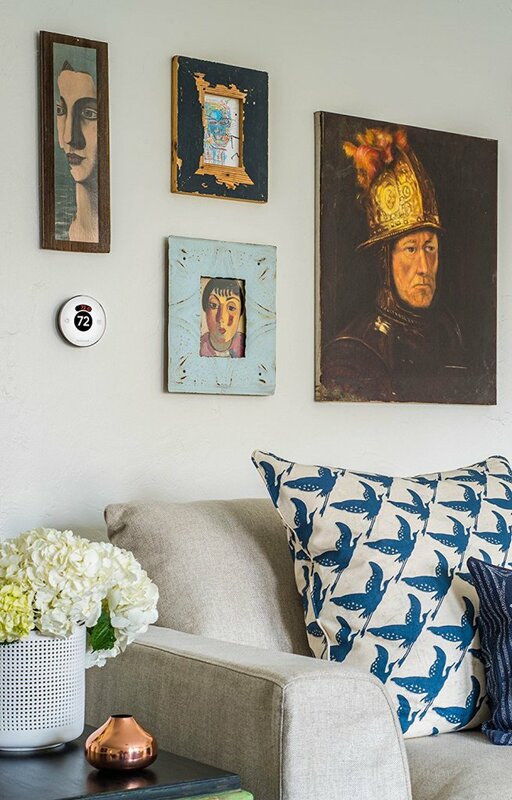 For an Airbnb setting, this helps because you can add a passcode to it, it’s extremely easy for your guests to figure out, and you don’t have to deal with the sensors that other smart thermostats may make you place around your home. The biggest advantage of using a smart thermostat is that if there is a decent amount of time between guests, you can easily switch your HVAC system on/off to save energy. If you don’t have bookings for 10 days in a month, your energy bill just went down a considerable amount. Our Standards & Expectations require that all members of the Airbnb community respect each other’s privacy. More specifically, we require hosts to disclose all surveillance devices in their listings, and we prohibit any surveillance devices that are in or that observe the interior of certain private spaces (such as bedrooms and washrooms) regardless of whether they’ve been disclosed. We recommend placing cameras outside your home, but not inside because there are other ways to monitor activity without being too intrusive on your guests. In conclusion, smart home technology can make you and your home more secure while also saving you money. There can be a learning curve, but we would be happy to help you set up your home! Whether it’s through free advice over email or visiting your home for a consultation, we’ll cover you every step of the way to have the perfect Airbnb smart home.